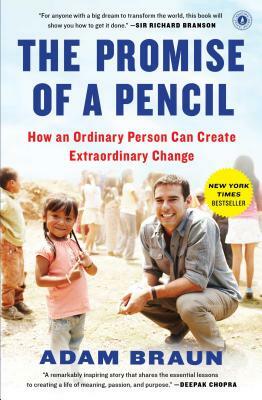 "For anyone with a big dream to transform the world, this book will show you how to get it done." "A remarkably inspiring story that shares the essential lessons to creating a life of meaning, passion and purpose." — Gary Vaynerchuk, CEO of VaynerMedia and New York Times bestselling author of Jab, Jab, Jab Right Hook and Crush It! "Braun's lessons are memorable, accessible, and powerful. This is a must-read, and a must-re-read, and a must-keep-in-view-on-bookshelf kind of book." "[An] exuberant testimony to the power of idealism. . . Braun’s story forcefully presents the advantages of silencing the head andlistening to the heart." "[Braun] skillfully weaves together his personal memoir and the professional challenges he faced... Informative and inspiring." "Braun shares his story of how he started Pencils of Promise, what he learned from Wall Street that has helped him...how he’s leveraged social networks to generate donations, and his best career advice."